So, once on holiday, you have to engage in a spot of doing stuff. Our family rules involve engaging in water sports, exploring some kind of building or historical site, visiting beaches with waves or doing something that has something for the kids and the grown ups. Following the rule of this blog to the letter, brûlée was on the menu, so it had to be ordered. 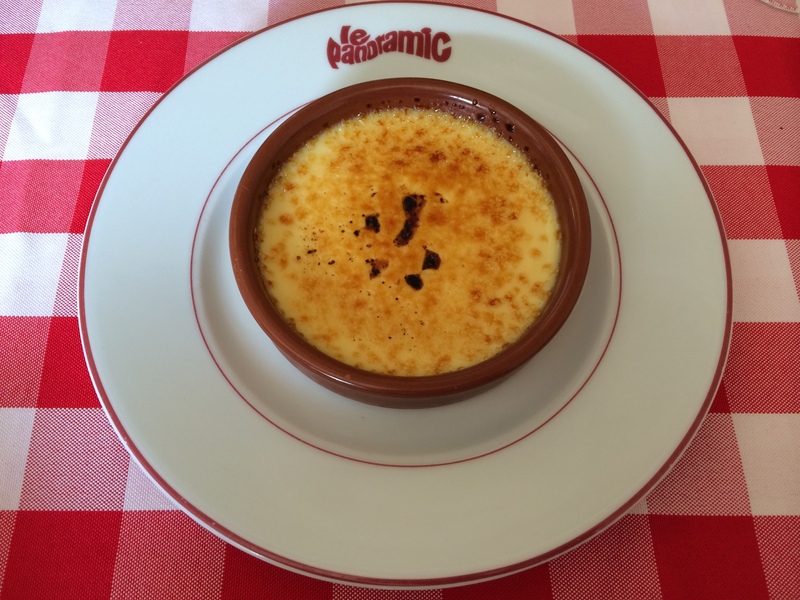 It was another simply presented marvel in a similar sized ramekin to the Brittany Bretagne post. Again, the lightly sugared caramelisation was easy to break through with a spoon to a cool, but not cold, and ever so slightly sweet custard. Whilst nothing exceptional it was very tasty and proved that on a count of two brûlées out of two, most French kitchens appear to be able to deliver their national dessert well. That said, this was a fine but everyday high volume production in a busy tourist restaurant, valiantly supported by the ‘entertainment’ throughout. 7/10.